We haven't done anything with chains for awhile. Although this is one of our very favorite hair techniques! I love this hairstyle because it's easy, quick, and simple but looks so unique. Every time the Princess has chains in her hair, she always gets tons of compliments. In case you are wondering, the cute brown/floral headband came from Every Little Detail. I love the way the chains look. I have done them where I braid the hair first then tie it. It works good too especially for those who have thinner hair. I have used your chain hairstyle tons of times on my girls. This morning, for school pictures, I thought I would take a creative twist with the chains and ended up doing this exact hairstyle on my daughter. I loved it! Thanks for sharing all of your beautiful hairdos! You are very talented. Wow this is adorable - and so easy to do! I used this on my daughter for church on Sunday. It was lovely, and very very easy! I did this on myself and it looks so cute! 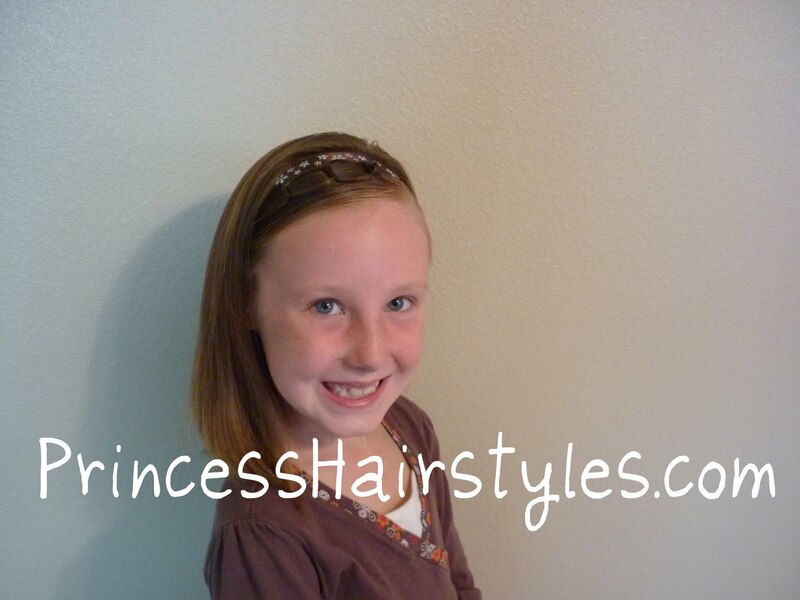 I don't have any sisters so I try to search for hairstyles to do on little girls that go to my church to model my hair stuff. This is my fave since it works so well with my headbands!! I did this hairstyle with a little twist. I put the chain right over the headband (mine was white) to help the chain stand out from the rest of her dark hair. It looked awesome. Thank you for sharing your amazing gift. IT'S A NICE IDEA TO DRESS GIRL'S HAIR. I love this style! It's cute and SO simple!!!!! All my friends loved how it looks so professional!! Whoever made this..... You are a GENIUS!! Hi do you have any hairstyles for shoulder length curly hair? My hair gets messy a lot so complex hairstyles don't usually come off good on me. any simple yet elegant ideas? love it! We've made crowns out of the hair net you can make with rubber bands. start with 5 bands, then 4, 3, 2, 1.....Then scrunch it in half to make a crown. I hope that made sense. More props to you for your descriptions of all these cute styles. I have LONG hair and it worked perfectly!!!! :) Love ya.